There are copious law firms who handle auto accident claims. For your sake, you want to be sure that the firm you choose is equipped and committed to securing your full compensation. 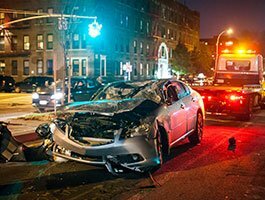 An Ocala accident attorney must understand not only the law but how to conduct a proper investigation, how to deal with insurance companies and, potentially, how to convince a jury to award damages. The King Law Firm excels at holding negligent drivers and insurance companies accountable. Our Ocala accident attorney has recovered millions of dollars for clients through our hands-on and determined approach. (See our Recent Results.) You can count on us for attentive service and aggressive representation if someone in your family was seriously injured in Marion County or in the surrounding areas of Central Florida. We are familiar with the major highways in Ocala and surrounding counties where accidents commonly occur, including I-75, I-4, and the Florida Turnpike, Highways 441, 301 and 41, and State Route 40. Founding attorney Greg King is a former law enforcement officer with extensive experience in accident and homicide investigation and reconstruction, which gives our clients an edge in demonstrating negligence of another person or entity. Any of these issues can help or hinder your recovery of damages. Our Ocala accident attorney works with our entire legal team to pursue all sources of coverage and anticipate such barriers to put you in position for maximum compensation. We work to ensure that the damages cover medical bills and future care, loss of income, permanent injury, and your pain and suffering. Our goal is to procure a timely settlement, but we prepare from day one to take your case to court if necessary to get justice. If your injury makes it difficult for you to visit our law offices, an Ocala accident attorney can visit you in your home or hospital room. Initial consultations are free of charge and come with no obligation. Our clients usually owe no attorneys’ fees until and unless we recover a settlement or verdict on their behalf. Call the King Law Firm toll free at 352-629-8747, or contact us online.